This is an optional RECON event involving the small moon of classical KBO Quaoar known as Weywot. The shadow path of Quaoar is predicted to be over South America, but the RECON network is within the 1-sigma zone of Weywot. The target star is dim at 15.2 and the event happens close to astronomical twilight for folks up north, but we encourage all who are up for the event to give it a try. You should plan to align on bright stars prior to the event and to get on the field using brighter stars located nearby the target star. To sign up for the event, select the TNO RIO Feed on OccultWatcher and sign up for the event on OW. You should make one continuous recording of the event. Either before or after the event, you should also make a short recording of your position information using the switch on the front of the IOTA-VTI box. Adjust the switch to POSITION, record the screen showing your latitude/longitude for 3-5 seconds, and then adjust the switch back to TIME. Thank you for keeping track of your observations using the RECON Observation Logsheet. 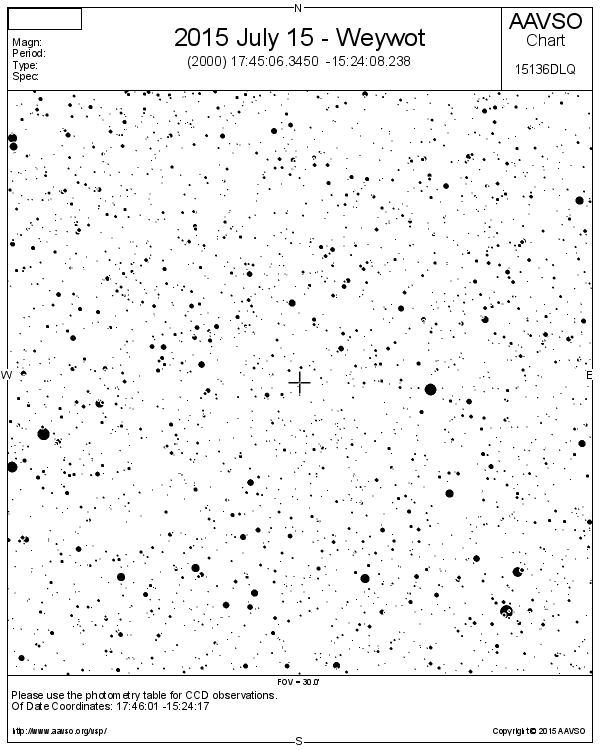 Starchart for Weywot produced using AAVSO VSP. Images of star fields for this event are welcome. Please send to tnorecon-org@mailman.boulder.swri.edu.